This blog post is timely. Alas, I was in a hurry so I didn't take photos, so I'm using the video and graphic that I've found on the web. First nice day after a long cold winter. I see the hose is already attached, probably from that last warm snap in December or January when I hosed off the walk. I turn on the spigot. Hmm, no pressure in the hose...WHOA! There's water squirting out of the wall! Not good. I kill the water. 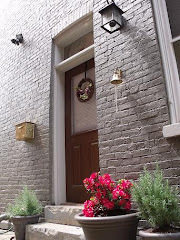 I feared a broken pipe, but since the water only came out of the brick wall when the spigot was turned on, it seemed doubtful that I had a broken pipe. Evidently, the spigot is called a "sillcock". 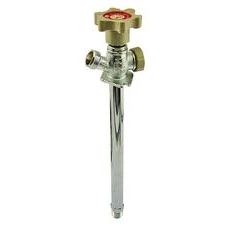 The sillcock is actually a lot more than a faucet, as it is a mechanism that extends from outside the house to inside the house, with the valve actually inside the house. As a result, when I left the hose attached and the water froze and expanded, it blew out the sillcock and not the pipes inside. That was good. So, we needed a new sillcock. How big? Well, first we remove the old one and see what we started with. Most plumbers sweat the sillcock directly to copper pipe. So, in order to get it out, you're going to need to un-sweat the pipe (break out the creme brule' torch), or cut it. I decided to cut the pipe. I've never sweated a pipe before. Cutting the pipe as close to the wall as possible gives you some flexibility. You can use the same size silllcock and cut the existing pipe back and then sweat in another length of copper, or you can use a larger sillcock and then just cut the pipe back to fit where the silcock terminates. The above video shows pretty much the same silcock failure and the repair is pretty good, too. I did mine differently. First, I suspect that modern sillcocks fail with a frequency that suggests that one plan for replacement. Since I don't want to learn how to sweat pipes and anyway I didn't want to sweat the pipe to the sillcock, I needed to come up with an alternative. Enter SharkBite fittings. It's a "push into place" fitting. No glue. No flux. No solder. You can join copper to copper or cpvc or pex. The fittings allow you to add a male screw or a female screw end fitting. Just measure, cut, deburr and emery board and then press fitting to pipe and you're done! And, you can undo your work with a $0.50 plastic tool! So, since the sillcock I bought was 14" and had a male screw end, I was going to have to cut the pipe back and affix a female threaded end fitting. This would allow me to simply UNSCREW the sillcock if I needed to repair or replace. No unsweating. In goes the sillcock into the existing hole. So, since the SharkBite female threaded end added roughly 3/8" to the pipe length after being installed on the pipe I marked the pipe 3/8" back from the end of the sillcock. Then I used a pipe cutter to carefully cut a nice clean end off the pipe. I then deburred the pipe and took some fine sandpaper to the pipe end, inside and out. Then I wrapped the end of the sillcock with Teflon tape, 3 turns worth. From there I threaded on the female SharkBite fitting. Make sure you get this tight when you do it, or you'll be leaking. Next comes the fun part. Go out side and make sure that the sillcock is facing the right way. Pull it out a little from the wall, and then apply a generous bead of caulk all the way around where the collar meets the wall. Slide the sillcock back flush and hopefully, you'll be able to use the same screws to screw the sillcock back in place. Go back in the basement (or inside). There should be about 1/2" overlap of the SharkBite fitting over the copper pipe. There should also be a bit of give, allowing you to push the pipe back a bit so that you can slide it into the fitting. Once you negotiate the pipe into the fitting, push them together firmly. Now comes the moment of truth! Close the sillcock valve and turn the water back on. Look at the fittings closely. If the screw on fitting is leaking, you're going to have to take it apart again (use that plastic tool), re-wrap the male fitting, and then screw it on TIGHTLY. Do not just try to tighten it without disassembling. You stand a chance of screwing things up royally if you do. After re-tightening the male/female connection, then slide the copper pipe back into the SharkBite connector snugly. If you have no leaks, you're done! Next time, remember to detach the hose at the end of the season. I got this idea some years ago from Matt Madison, when he was growing his own greens for Findlay Market. The idea is to build a long box up and away from slugs and at a height that you can easily reach and a size that you can easily work in. 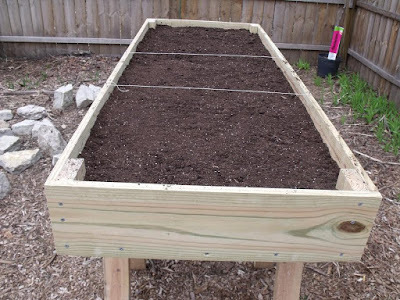 You can plant your greens rather densely and in several courses (I divide the box up into zones and plant each zone a week or so apart so that I have a near-never-ending supply of fresh greens to harvest. You can also create custom blends, which is worth it since you don't have to worry much about losses due to slugs. I've mixed beets and swiss chard into my greens mix before. The baby greens are very nice. You should also amend your soil with some minerals to improve the flavor and nutrition of your greens. I'll be adding some "green sand" to mine. I've used Pressure treated lumber here, as they no longer put arsenic in it. If you're still uncomfortable, you can use non-PT lumber, but you'll want to brush the boards with mineral oil to preserve them. 2 saw horses. I'll leave it to you to buy or make them. Just make sure that they are waist high, as you want the box to be high enough so you aren't bending. Cut the corrugated roofing panel to size with a circular saw (use a finish blade, if you can--make a test/practice cut first off the end). Measure and make sure it is exactly 6' or slightly less. If you're much off, you'll want to adjust the lumber sizes. Cut all your pieces lumber to size per above. Try to be exact, as it will make for a more sturdy box. 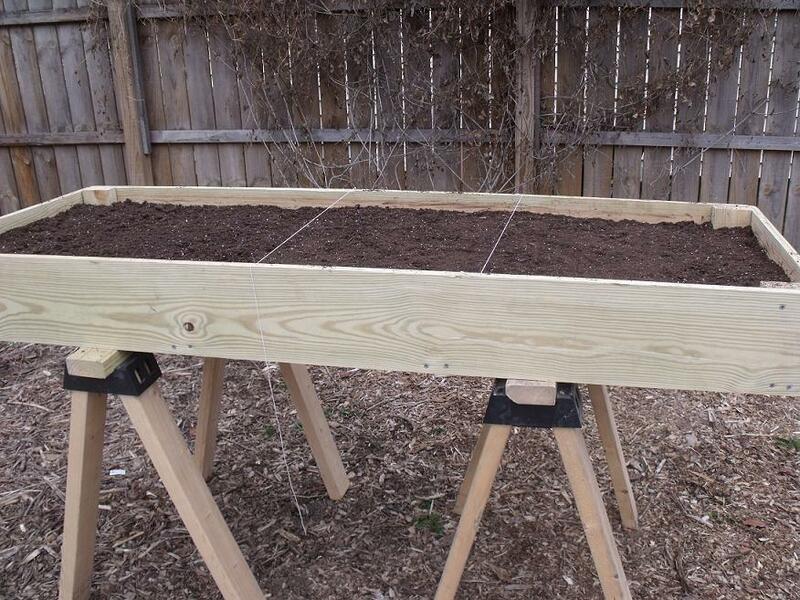 Next, attach the 26" 2x4 cross-members to the long 1x10x6' boards with the 2" screws. Start with one at each end and then 2 24" from each end. The 2x4's should be flat and you should screw through the 1x10 into the ends of the 2x4's. 2 screws each side should suffice. EVERY hole should be pre-drilled. 1x10's tend to split easily. Screw the end side 1x10x27 1/2" panels to the side cross members with 5 screws. Again, pre-drill every hole. You should be able to set the box on your saw horses unless you are making your own legs. This will make the next step easier. Center the 24" closure strips (wavy supports) one on each of the cross members. 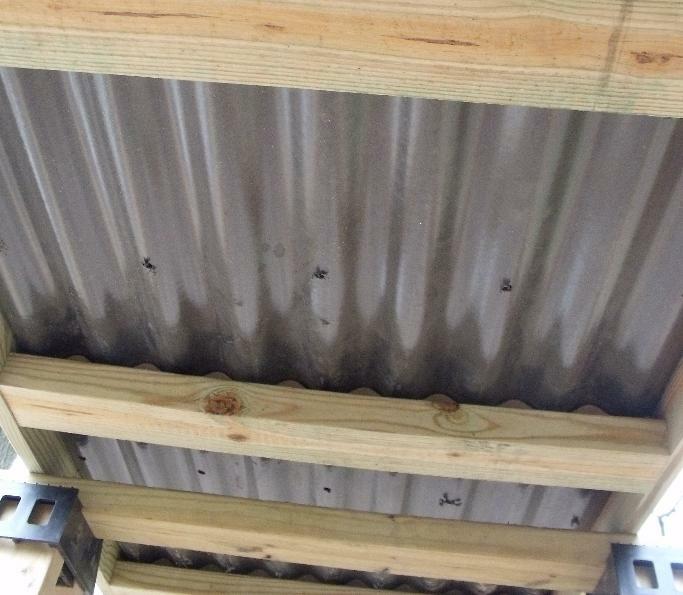 Set the corrugated roof panel into the box so that the sides of the panel curl up, not down. The fit should be fairly tight and the panel should rest on the closure strips. Reach under the box and feel for the closure strips on top of the 2x4 cross members. If they are reasonably centered, use 2" screws to fasten the panel in two places to each cross member through the closure strips. You should be able to eyeball this and feel to confirm that you are drilling into the closure strip. 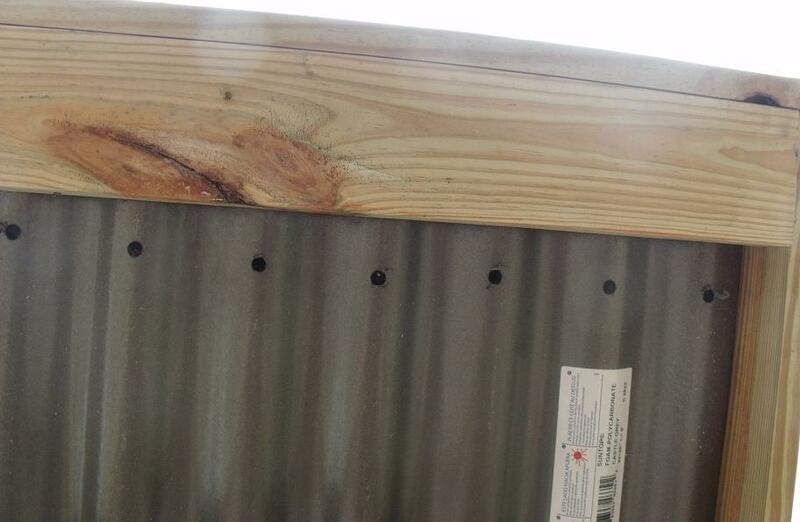 You want to drill through "high points" on the roof panel so that you do not over-penetrate the cross member. Attach the 4 blocks to the corners using 2 1 1/2" screws each to the long 6' panels first. Make sure the blocks are flush with the top of the box and the end of the 6' panels. Then, screw the end panels to the corner blocs with 2 2" screws each. This should be a very sturdy box. Before putting dirt in the box, you'll want to drill some holes for drainage. I used a 5/16" spade bit. I put a hole in each trough at each end, and then a few alternating holes toward the middle, just in case. See the pictures below. 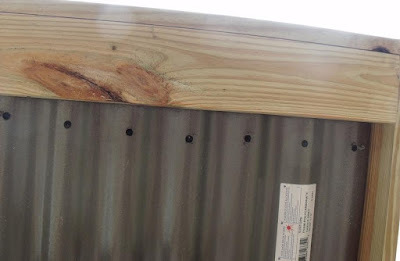 Close up of the end holes.